Kass is pissed because she was left out of Tony and Woo flipping (Trish understands). We all know Kass turns to Chaos Kass when she feels bitter so beware. The next morning, Kass kinda overhears Tony mentioning her (he mentioned Kass is sleeping later than usual) and blows it out of proportion. Tony insists he didn't say anything but Kass ain't buying it, continuing in a bickerfest between the two. "Make sure you play your idol," Kass says and Tony drops the bomb: "I have a special idol." Given Tony's island reputation as the boy who cried idol, no one is fully buying it but we know. We know. The survivors are split into two teams of three to knock down a wall with sandbags, then build it back up. The reward is emotional fulfillment by being Survivor ambassadors and bringing goods to a local school. But since kindness isn't enough motivation, the children will also get a bellyful of hamburgers and hot dogs. Who can resist some Grade A American meat? Spencer, Kass, and Woo win reward which means the children will get to experience the Double Bun magic. But if Woo doesn't put his hair up it'll be strictly hamburger and hot dog buns. 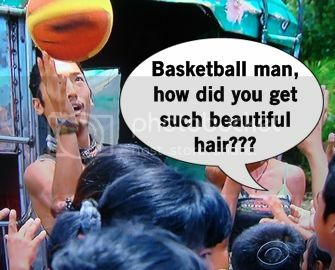 With his hair in his signature style, Woo, Spencer, and Kass arrive at the village to bring backpacks, basketballs, globes, and lots of goodies. Spencer calls the kids little monsters, while Woo continues to dominate as most adorable by doing a martial arts demonstration. Kass is charmed by Woo (as we all are) and decides to make a move. Kass suggests they team up to take out Tony, perhaps even to the point of making a final three deal. Woo is a little hesitant and pretty quiet cause Tony's his island bestie, but in order to win you need to make a move. "I'm in," Woo says as they arrive back at their beach. Now back at camp and ready to play, Spencer tells Tasha about everything that went down. Trish and Tony wonder if the others got to Woo, and Woo poorly lies saying Spencer/Kass want to take out Tasha. Tony knows it makes no sense for Spencer to want to lose any of his numbers, so it crosses his mind that his loyal Woo might be turning. The gang meets up with Probst again for this week's Immunity Challenge. 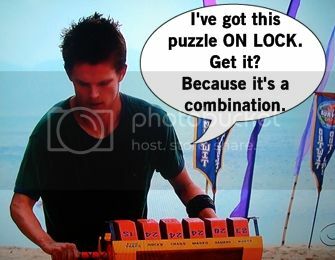 There are six different stations with items to count, which are the numbers to complete a combination lock. A little twist on the typical combination challenges, so this is fun. And it reminds me of the Big Brother nonsense ones where you guess like how many plastic spiders are in a kiddie pool. Instead it's a reasonable number of crabs, buoys, bamboo, etc. You'd think this would be a quick challenge, but it's not at all. In the slightest. People won balancing challenges in less time than counting for combinations. 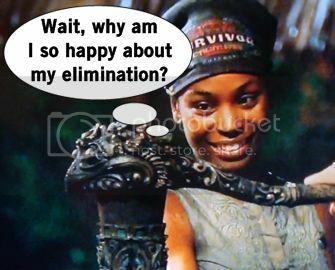 After 25 minutes, Spencer wins immunity - killing Tasha's potential tying record. Spencer, Tasha, and Trish talk in the woods and the plan is the guys vote Tony, the girls for Trish (that way they're covered when an idol is played). Woo is still really worried about the betrayal, very quiet about everything. Tasha keeps up appearances, pretending to be sad she's going, but Tony doesn't buy her complacency. Tony tells this to the others and hints that he'll play an idol to stay, though he won't confirm if he really has a special idol. 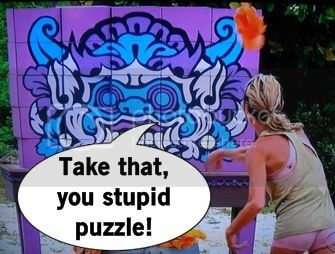 Kass thinks Tony is the new Russell Hantz where he makes it to the end and everyone hates him, spurning him the votes. Suddenly Kass is asking Woo if they should take out Tasha. 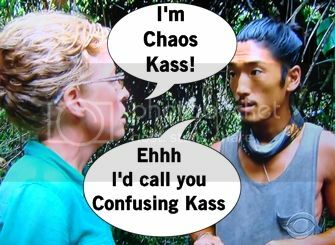 It's less Chao Kass and more Confusion Kass. Tribal Council time! Tasha challenges the others to step up and notice Tony's threat status and try to take him out. Tasha tries to downplay her challenge dominance and deflect to Tony being a strategic force that no one can take out. Tony is relying on the loyalty and trust of his alliance to keep them strong. Tony's reminds them if the idol is flushed it might return and end up in the enemy's hand. Trish comes to Tony's defense and mentions how Tony offered to use the idol on his alliance if need be. Woo says something about sticking to the plan. Kass thinks tonight could be a blindside and that's awfully telling. The votes are cast. Tony doesn't play his regular idol and everyone smirks like "We got him good!" But it's Tasha who got-got when Kass and Woo stick with their original alliance. I like Tasha but I don't disapprove of this move. Spencer and Tasha are the clear favorites with the jury and bringing one of them to the end is handing them a million dollars. Underdog story + good at challenges + all your former tribemates on the jury? No brainer.